Canyon Lake is most famous for its incredible muskie population, walleye fishing and large size and numbers of smallmouth bass, perch and northern pike. If you are looking for lake trout we have lakes close by with good populations. 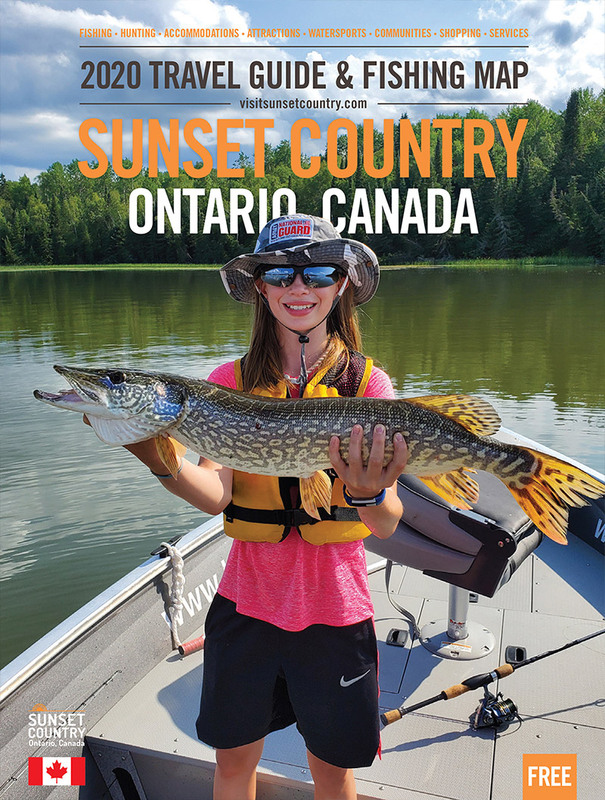 Easy to navigate, very few hazards and little other boats make Canyon Lake in Northwestern Ontario the perfect fishing destination. Est. in 1936, we are only the 3rd owners. North Country Lodge has 7 well maintained modern cabins. You get guidance and personal service. Our yurt with BBQ/ fire pit, lodge with tv/games and very large yard make it a fun family place to vacation. For those who don’t want to fish the whole time, you can explore the waterfalls, go hiking, enjoy the ATV trails, try blueberry picking, mountain biking, canoeing, kayaking or water play to your heart's desire! Cabin Rentals (Housekeeping): We have warm and comfortable lakeside housekeeping cabins on Canyon Lake, which are fully furnished and have enough space for all your gear. Walleye: There are many walleye in the 1.5 lb range in Canyon Lake that are perfect for eating. The lake is also loaded with trophy walleyes 10lbs or more. Northern Pike: We fish for northern pike on our outpost lakes which are close to the lodge and are easily accessible by ATV or 4wd trucks. Muskie: Muskie fishing on Canyon Lake is great from June to Oct. Many are in the 20-30lb range with a few being in the 50 lb range. Lake Trout: There are no lake trout in Canyon Lake, but we do have easy-to-get-to outpost lakes, which have outstanding lake trout fishing. Smallmouth Bass: We fish for smallmouth bass on Canyon Lake which has rocky points, a rocky shoreline, sunken shoals and islands which are perfect habitats. Perch: We have jumbo perch in Canyon Lake. Perch's meat is white and firm and is great tasting. We also have perch fishing on our nearby outposts lakes. Black Bear: We offer black bear hunts in the fall. Our BMA is about 35 square miles and is filled with trophy bear. Black bears are usually between 225-425 pound range. Deer: Dryden / Vermilion Bay area remains one of the top places in the world for deer hunting. Cabin, boat, motor and more included in your package.